What predicts clinician dropout of a state-sponsored training program on best practices for improving children’s mental health? In the U.S. , 1 in 5 children currently have or will have a serious mental disorder. State mental health systems care for many of these youth and are increasingly looking for ways to both improve the outcomes of those they serve, and lower the costs of providing this care. For the last decade, New York State (NYS) has been a leader in providing clinicians training on best practices, known as evidence-based treatments (EBTs), with the goal of improving children’s mental health. However, training program data show that half of mental health professionals do not complete voluntary state-offered EBT trainings. The goal of this study was to better understand who drops out of these costly and time-consuming EBT training programs by analyzing data from a recent NYS-sponsored training, called Managing and Adapting Practice (MAP). Fig. 1. Clinician and chronic characteristics that predict dropout of children’s mental health training program (managing and adapting practice). The MAP system is a sophisticated computer-based program to help mental health professionals (a) select treatment components that work best for specific children and (b) monitor their progress over time. NYS offered free MAP training to all clinicians in state-licensed clinics. Data from 127 participating clinicians were examined. Using multiple sources of data, we analyzed both clinician and clinic characteristics to see if any of these characteristics were predictive of who dropped out of the MAP training program. Individual clinician characteristics analyzed included age, ethnicity, gender, education, employment (part-time or full-time) and whether or not they were licensed social workers. In addition, data was collected on clinician caseload, the supervision they experienced, their experience with technology, use of scientific resources, and how many cases they managed using the MAP system. We also examined clinic characteristics, including clinicians’ perceptions of their work environment, the level of innovation at the clinic, client insurance status, geographic location and clinic affiliation (e.g. community-based, hospital-affiliated, or a NYS Office of Mental Health (OMH) operated facility). Similar to a previous analysis of NYS training data, we found that approximately half the clinicians (51.2%) who began the MAP training dropped out. Only two characteristics were found to be significant predictors of dropout: clinician age and clinic location. We explored the characteristics of these two predictors. Older clinicians were more likely to dropout from training; perhaps reflecting their sense of greater clinical competence and influence within their work environment. Older clinicians reported that weekly tracking of client progress did not fit with how they were trained; the technological demands of using computer-based programs to track weekly progress were also observed to be challenging. In terms of clinic location, those working in downstate-urban areas (compared to upstate-rural areas) were more likely to drop out of training. Clinicians from upstate-rural clinics were more likely to come from clinics that were more innovative, as reflected by being high-adopters of other state-sponsored EBT trainings. Their retention in MAP may also reflect the greater motivation of rural-based clinicians because they are likely to have fewer opportunities to engage in training. 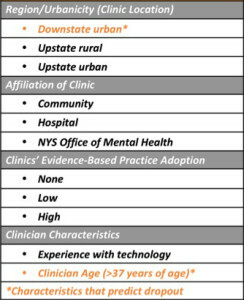 Interestingly, none of the upstate-rural clinicians were affiliated with OMH-operated facilities; most (75%) were from community-based clinics. The findings of this study indicate the importance of tailoring state-sponsored EBT trainings. Like many provider trainings, the NYS MAP training followed prescribed protocols, meaning that it was a one-size-fits-all training which did not take into account clinician characteristics such as comfort with technology, clinical competency, learning preference, or workplace context. To better engage clinicians and ensure that state investments in these trainings to improve youth outcomes are maximized, trainings should be tailored to clinician characteristics. Developing more effective ways to train clinicians is essential to meeting the demands of the current system-wide healthcare changes. Olin SS, Nadeem E, Gleacher A, Weaver J, Weiss D, Hoagwood KE, Horwitz SM.